We have had a fantastic first half term in Little Owls. On our first few days we met new friends and explored our new learning environment. 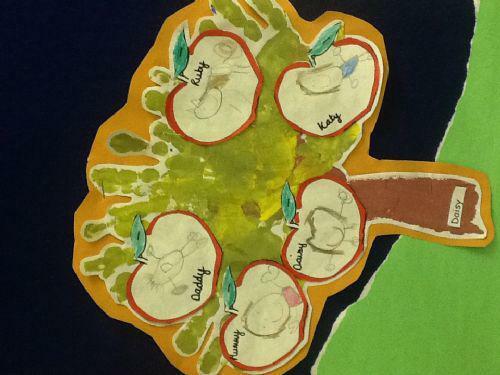 We talked about ourselves and the people in our families and we made family trees using arm and hand-prints. We have enjoyed listening to and talking about traditional stories such as The Gingerbread Man, Goldilocks and The Three Bears, The Billy Goats Gruff and The Three Little Pigs. We have done lots of different activities based on these stories such as sequencing pictures, ordering items by size, describing positions, designing and baking gingerbread men, making a Billy Goats Gruff story setting, making a craft goldilocks and painting a bear. In addition to these stories we have explored the season of Autumn and the Harvest. This work was supported by seasonal and other stories such as Oliver's Vegetables and The Little Red Hen. We have practised harvest songs and performed these at the Harvest Festival. We know that vegetables are good for you and made some lovely vegetable hats to wear at the festival. We also explored pumpkins and made and tasted pumpkin soup following the Pumpkin Soup story. In PE we have recreated traditional stories through dance and story character movements (our favourite was the duck in the Little Red Hen! ), moved over and under apparatus in different ways, practised object control using hoops, balloons, balls and beanbags and played games such as tiggy scarecrow and spiders and scorpians. In maths we have been rote counting forwards and backwards to 20, counting groups of objects, saying the names of numbers, ordering numbers and learning that a number of objects stays the same until something is added or taken away. We have been learning how to add and take away using pumpkins and conkers. We have also been reciting the days of the week and saying the day that comes before and after a given day. In phonics we have been learning the sounds letters make using Jolly Phonics (you can find the actions we use in the home school liaison book). We have been learning how to blend these sounds into words for reading e.g. c-a-t is cat and l-o-ck is lock and how to segment words into sounds for writing. We have been practising reading simple sentences and captions such as 'A cat and a dog.' and learning some tricky words such as I, no, go and the. Dough disco helps us warm our hands up for writing and we enjoy practising cursive letter formation on whiteboards, on large paper, in flour, with the pom poms and on the class screen. What busy bees we have been!